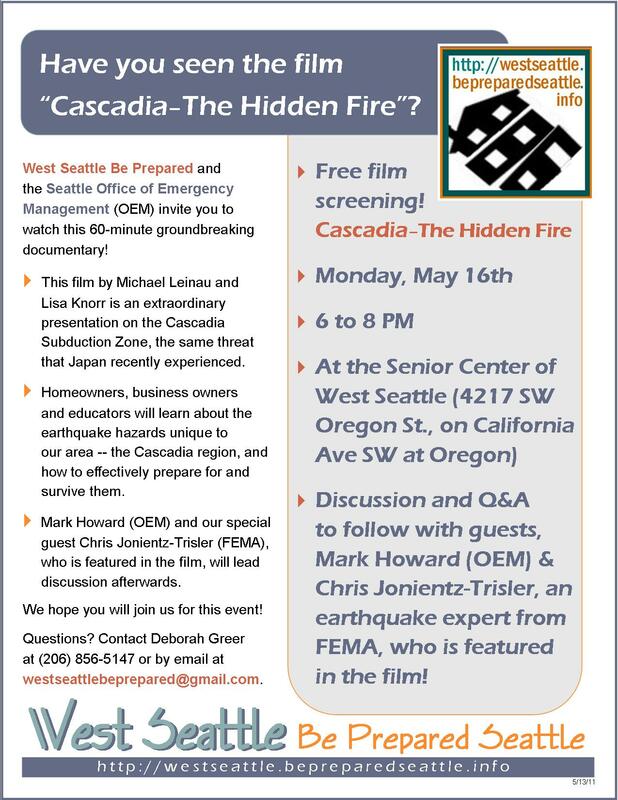 Reminder: Cascadia film event is this Monday, May 16th! We hope you’ll join us for the 2nd event in our 2011 Training & Education series! We will be screening the powerful documentary film, “Cascadia – The Hidden Fire”; discussion and Q&A will follow. This entry was posted in Announcements, Earthquake Preparedness, Events, Training & Education series and tagged Cascadia: the Hidden Fire, Chris Jonientz-Trisler, disaster preparedness, earthquake preparedness, Mark Howard, Seattle Office of Emergency Management, Training & Education series, West Seattle Be Prepared. Bookmark the permalink.